The New Testament relates an occasion when, upon visiting the Temple of Jerusalem during Passover, Jesus found it filled with livestock and turned into a marketplace by merchants and money changers. 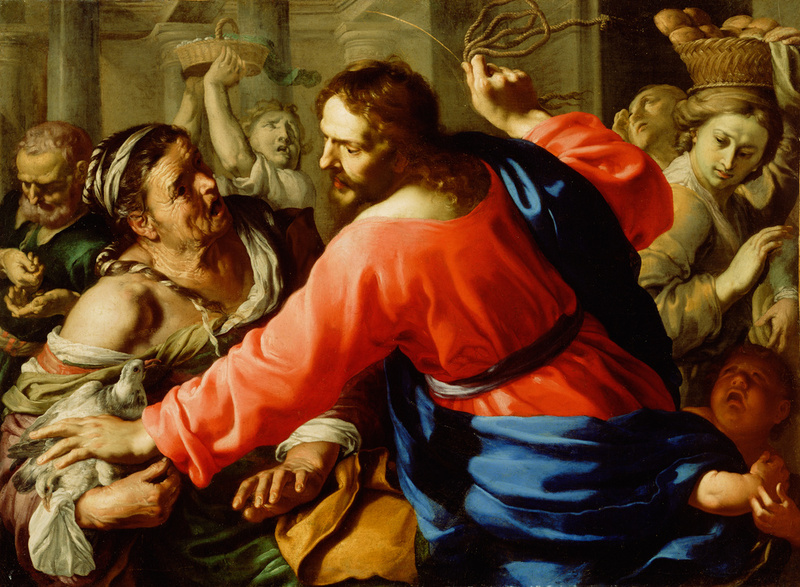 Furious that the sacred place had been turned into a “den of thieves”, Christ fashioned a whip out of cords, and drove them from the temple, overturning tables as he went. In this animated composition, the diagonal thrust of Christ’s movement through the crowd, and the monumental figures reeling in his wake, Bernardino Mei convincingly conveys Christ's righteous anger. This was a popular subject amongst other contemporary seventeenth-century painters, because it offered an opportunity to illustrate a scene laden with tumultuous action and intense emotion. Following the Counter Reformation, it was also seen as symbolic of the recent overhaul of the Catholic Church. Features such as the half-length figures, their unidealized faces, and their positioning in the extreme foreground are borrowed from the Caravaggesque tradition. Mei deviates from this tradition, however, by bathing his composition in unifying, silvery light, which harmonizes the colors, and makes the painting distinctly different in character to works by Caravaggio and his followers, whose use of strong, directional light creates stark contrast between highlights and shadows. Augustus Arthur Vansittart, 1824 - 1882 (Bisham Abbey, Berkshire, England), by gift to the the Fitzwilliam Museum. Marcello Guidi (Florence, Italy), sold to the J. Paul Getty Museum, 1969. Colvin, Sidney, ed. A Brief Catalogue of the Pictures in the Fitzwilliam Museum (Cambridge: University Press, 1898), p. 28, no. 139. Earp, F. R. A Descriptive Catalogue of the Pictures in the Fitzwilliam Museum (Cambridge: University Press, 1902), p. 13, no. 139. Sotheby's, London. Catalogue of Old Master Drawings and Paintings [...]. May 11, 1955, p. 8, lot 45. "Recent Accessions of American and Canadian Museums, April-June 1971." The Art Quarterly 34, no. 4 (1971), pp. 498, 503, ill.
Fredericksen, Burton B. Catalogue of the Paintings in the J. Paul Getty Museum (Malibu: J. Paul Getty Museum, 1972), p. 55, no. 62, ill.
Baroque Masters from the J. Paul Getty Museum, exh. cat. (Northridge: California State University, 1973), p. 21, no. 27. Riedl, Peter Anselm, and Max Seidel, eds. Die Kirchen von Siena. Vol. 1.1, Abbadia all'Arco-S. Biagio (Munich: Bruckmann, 1985), p. 119, under no. 64, entry by Alessandro Bagnoli. Anderson, Jaynie. "Bernardino Mei." In Baroque III, 1620-1700, exh. cat. (London: Matthiesen Fine Art Ltd., 1986), p. 128. Bisogni, Fabio. "Bernardino Mei." In Bernardino Mei e la pittura barocca a Siena, exh. cat. Fabio Bisogni and Marco Ciampolini, eds. (Siena: Palazzo Chigi Saracini, 1987), pp. 163-64, 166, fig. 80. Bisogni, Fabio. "Introduzione." In Bernardino Mei e la pittura barocca a Siena, exh. cat. Fabio Bisogni and Marco Ciampolini, eds. (Siena: Palazzo Chigi Saracini, 1987), p. 25. Bagnoli, Alessandro. "La pittura del Seicento a Siena." In La pittura in Italia: Il Seicento. 2 vols. Mina Gregori and Erich Schleier, eds. (Milan: Electa, 1988), vol. 1, p. 348. DeGrazia, Diane, and Pier Giovanni Castagnoli, eds. Selected Baroque Paintings from Italian Banks, exh. cat. Robert Erich Wolf, trans. (Washington, D.C.: National Gallery of Art, 1990), p. 80, entry by Alessandro Bagnoli. Jaffé, David. Summary Catalogue of European Paintings in the J. Paul Getty Museum (Los Angeles: J. Paul Getty Museum, 1997), p. 84, ill.
Ciampolini, Marco. Drawing in Renaissance and Baroque Siena: 16th- and 17th-Century Drawings from Sienese Collections, exh. cat. Hugh Ward-Perkins, trans. (Athens, GA: Georgia Museum of Art, 2002), pp. 221, 223, under no. 46, fig. 1.